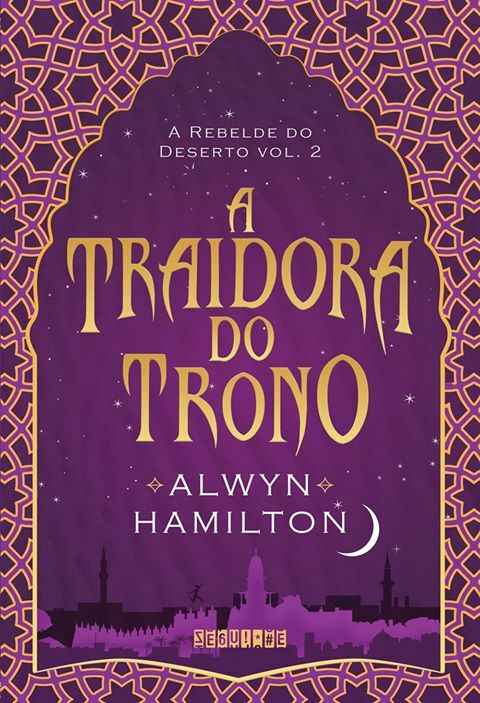 Finalmente foi revelada a capa do terceiro livro e último da série A rebelde do deserto, de Alwyn Hamilton. 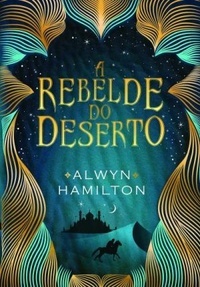 O livro ganhou o título de Hero at the Fall e também teve um trecho revelado, que vocêd conferem abaixo, no original em inglês. Garanta já o seu exemplar de capa dura em inglês na Amazon. Izman looked different from above. I was standing on the ledge of the great prayer house and I could see the crowd assembled for the Sultim trials far below us. That was why we’d picked this spot, to keep an eye on this morning’s proceedings. Because it sure as hell wasn’t for the comfort of it. I shifted as much as I dared on the narrow ledge, try­ing to get a better view of what was going on. I teetered forward a little as gravity reached up for me, and to my right Jin instinctively grabbed my arm, steadying me be­fore I could plunge hundreds of feet to my death. “I don’t have it in me to lose you, too, Bandit,” he said as he anchored me to our perch. Maz and Izz flanked us on either side. They’d flown us up here, taking the form of two giant Rocs, just before day­break, when people started to gather. The sun hitting the golden dome of the prayer house made it blaze so bright it almost blinded me, even with my back to it. Which meant it would blind anyone in the crowd who might happen to glance up our way, making us seem like kaleidoscopic il­lusions in the light instead of flesh and blood. When I was down in the streets, the city was a latticed puzzle box. Sharp corners, hidden alcoves, unexpected dead ends. Long streets pierced occasionally by windows that leaked whole other worlds onto the dusty paving stones. Narrow passages made all the narrower for be­ing lined by market stalls and a steady stream of people. The whole thing was lidded by colorful canopies blotting out the sky. I still hadn’t managed to solve the city, even af­ter nearly a month of being trapped inside it by the great dome of fire. The reaction to waking to a great dome of fire over the city had been something else. I knew it was one of Leyla’s unnatural inventions the moment I saw it. But the people believed that it was ancient magic, the likes of which hadn’t been seen since the end of the First War. Many were calling it Ahmed’s Wall. Some had even be­gun praying to it. Ahmed’s Acolytes, so called. Men and women who singed their clothing and smeared their faces in ash and spent their days trying to get as close to the great barrier of fire as they could in order to pray for it to hold against the invaders at our gates. No matter how many times the Sultan’s soldiers turned them away, they kept coming back, dawn after dawn. A few had even died getting too close to the barrier. Disintegrating like the stone Jin had thrown at it the day it appeared. They preached that Ahmed had saved us all. I hated to admit it, but it was possible the barrier had saved us. Though I knew it was nothing to do with Ahmed. From our perch up here I could see the lines of blue tents encircling our city with military precision. Waiting. Just like they had been for weeks. After the twins saw them on the horizon, it wasn’t long before they got to the city. Bullets had disintegrated against the barrier of fire, too. And, quick enough, the Gallan had gone silent, simply encircling the city. Playing a waiting game with the Sultan. The Gallan had occupied our desert for nearly two decades. They had put our Sultan on his throne, helping him usurp his father and brother. And in return he had let them impose their laws on us. Let their twisted be­liefs guide them to kill Demdji and First Beings. Force our poorest people into dangerous labor to churn out enough weapons for them to fight their wars. Inflict their violence on us without fear of repercussion from the law. The Sultan had let it happen and waited until the Gallan didn’t serve his purposes anymore. Only then had he tried to annihilate them. But we’d got­ten in the way, seeing as he would’ve taken a whole lot of Mirajin citi­zens with him, and the only thing that was achieved was aggravating the Gallan into an invasion. Then he’d aggravated them further when he lured their king into a trap and killed him. And now here we were, under siege from the largest empire in the world. They seemed to think they could wait us out on the other side of that wall of fire. Izman was bound to run out of supplies eventually. But I knew a thing or two about the Sultan. I had a feeling he was still playing games with them. And the Sultan didn’t play games he didn’t think he could win. I wondered how many Mirajin villages and towns the Gallan had stormed through on the way to Izman during their turn. How many people had died in their path as the Sultan waited for them to come to him. The Sultan had claimed to me once that his purpose was to protect his country. That he was establishing Miraji as a force to be reckoned with, one that no foreign army would occupy ever again. Maybe that would be true. But how many Mirajin bodies would be trampled on our way to so-called safety? The people of Miraji had not agreed to be pieces in this game the Sultan was playing against foreign invaders. We were going to end the game. We were going to get Ahmed back. And Rahim back. And Shazad. And Delila. And all the others who had been captured. And we were going to end this.